KATHMANDU, Nov 22: As Rastriya Prajatantra Party-Nepal (RPP-N), the fourth largest party and a crucial component of the parliamentary opposition, declared unification on Monday with Rastriya Prajatantra Party (RPP), one of the parties in the ruling coalition, national politics could witness some dramatic changes in the near future. The unification process between the two parties had received a jolt in August when RPP decided to join the Pushpa Kamal Dahal-led government and RPP-N decided to remain in the opposition. In the following two months, the two parties started fresh initiatives for unification and they reached a final deal last week. The unified party will carry the name of RPP and the flag of RPP-N. Following the unification, RPP will be an influential fourth largest party with 36 seats in Parliament. "Following the unification, all the parliamentarians elected from RPP-N will sit in the ruling benches from tomorrow. We are no longer in the opposition. Our unification will further strengthen the present coalition," said Mohan Shrestha, central committee member of the unified party and former deputy spokesperson of RPP-N. The unification could have greater impact on the move of present ruling coalition to amend the constitution than on the coalition itself. While electing Pushpa Kamal Dahal prime minister, there were 370 lawmakers in the ruling coalition. As CPN (Maoist Center) lawmaker Bhakti Prasad Pandey passed away last week, there were 369 lawmakers remaining in the ruling coalition. With 25 lawmakers from the erstwhile RPP-N now joining the ruling coalition, the number swells to 394. This is just two short of the number needed for a two-thirds majority of the existing 594 seats in Parliament. If the numbers alone are considered, the ruling coalition has the probability of garnering the two-third majority in Parliament required for a constitutional amendment as only the main opposition CPN (UML), the CPN (ML), Nepal Workers Peasants Party and Rastriya Janamorcha are clearly against amendment. "The central executive committee and the central committee of the unified party will meet on Tuesday and Wednesday to make clear its stance on the issue of constitutional amendment. However, it is clear that we'll remain flexible over amendment matters," said Shrestha. 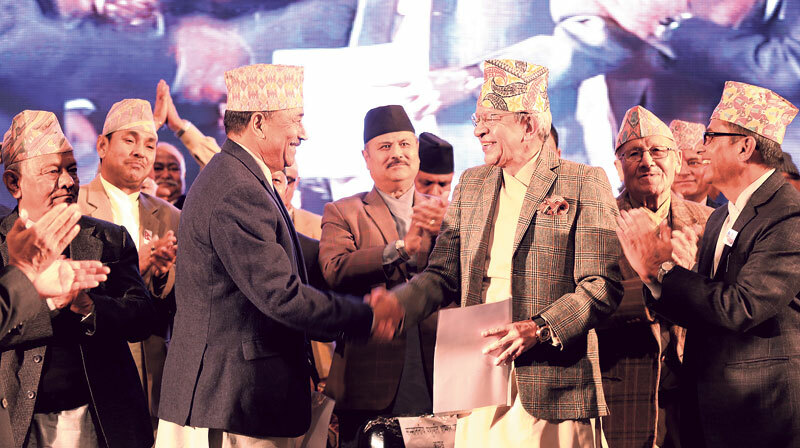 Hinting at the present political deadlock while speaking at the party unification function in Kathmandu, Monday, party executive chairman Thapa said that constitution implementation will not move forward unless the issues related to Madhes are resolved. "If the issues of Madhes are not addressed on time, constitution implementation could hit a jolt. We should be flexible and rise above party interests," said Thapa. The unification could to some extent rekindle the agenda of reinstating Nepal as a Hindu state but it depends on how the unified party puts forth the agenda in the course of the amendment. The unified party has declared Pashupati SJB Rana as its national chairman and Kamal Thapa as executive chairman. Lokendra Bahadur Chand, Bishwa Bandhu Thapa and Dr Prakash Chandra Lohani are senior leaders on the 300-member central committee.